Translation Software: Work Smarter, Not Harder | Language Solutions Inc. If technology doesn’t help you to do your job better, why use it? The same question can be said when using translation software. We know translation technology helps us do our job better. However, it can also be a hindrance when translators or project managers are not proficient in the tools they work in. Attitudes toward translation tools vary greatly among translators. What ultimately matters is that translation tool has to make sense to the translator in their daily workflow. While we cannot always work with translators on the same technology, we try to be compatible with other systems and help in any way we can. On the other hand, probably 99% of our work relies on working with these tools simply to be able to meet customer needs. The ability of a talented translator to be proficient in the translation tools and to understand the value of the translation tool is has a direct relation to our success. Language Solutions primarily works with SDL Studio, but we also have experience with other translation technology. Here are some ways to think about translation technology that make you work smarter, not harder. Agencies who do not charge project management time for file preparation may get complacent and let their translators handle the file setup. Translators focus on words, context, relevance, etc. If a file has a lot of broken segments, unnecessary formatting tags, code, or text out of context, the translation tool will simply not be of relevance to the translator. As translators, it’s important to call upon that factor and either charge for the time to work with the file or send it back to have it cleaned up. If you want to learn more about what we look at in preparing a file for translation, read all about it for InDesign or Word. How often do people really set up their software to meet their personal needs as opposed to running with the default settings? Maybe not if you use a program every now and then, but most translators use translation software on a daily basis. Some translators may work in multiple platforms. Most of the translation software platforms work in the same way where you have a bilingual view. They make use of Translation Memory and a Termbase database technology that can be called upon automatically or manually. Translation happens in target segments and can be addressed a translation status. All these operations can be manually set up so that they can be accessed in the same way. Project Managers and Translators should invest a little bit of time to setup their translation environment in a way that makes sense. That includes setting up how to confirm segments for translation, how to search for translation memory strings (concordance) and other operations. Translation technology has to compensate for the fact that you are not working directly in layout. Take some time to learn the different ways in which your software is informing you about content structure and see whether your software has the ability to preview translations in layout. If your translation document was processed from Word or PowerPoint, chances are you can preview the translation so see things in context. In SDL Studio, you can also see what segments are part of the same paragraph, or table cell or whether it is a headline or not. That information is shown on the right hand side of the target segment. Translators who have worked long enough to know what it was like to work on translations before translation tools may feel more comfortable working in a bilingual Word table. Adoption of technology can be intimidating. Translation technology is as much of a monetary investment as it is an investment of time. While there are plenty of resources available for each tool, we find that translators often are helped by training “in the moment”. A simple session through free programs like Teamviewer to address current issues with a file or feature can be a great help to move projects forward and learn from best practices. Translators work in different ways. Some prefer to go over a file in multiple rounds and focus on one thing at a time (translation of words/creative writing, formatting, fine-tuning and accuracy). Others may prefer to do everything at once and run a final check at the end. 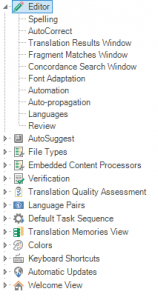 Translation tools are flexible to accommodate quality checks for different work methods. However, often we see that the tools are not used to its fullest extent. Accuracy reporting in translation software can sometimes become a nuisance. Some of these tools have become so extensive that, in a simple one page document, you may end up with 30 messages that may not even be relevant. However, professional translators typically work in one or two language pairs at the most and so they can set up their report settings to default to whatever makes sense. For instance, if you translate a lot for the United States in a language other than English, having the software automatically check for foreign punctuation may not be sensible. Typically we see that decimal points stay in the English format so the setting should be adjusted to check for US decimals. Spanish translators can typically check for Spanish punctuation. French translators have the ability to check for intentional spaces before the colon. 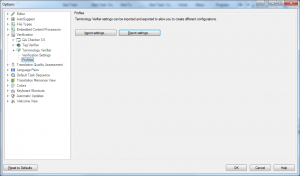 Eliminate any settings that do not make sense in your language and save your settings as a default workflow. The software that we work with (SDL Studio/Trados) can verify the translation as you go along. Translators who don’t mind being interrupted by warnings or error messages as they translate should be able to address most issues before they run a final check. 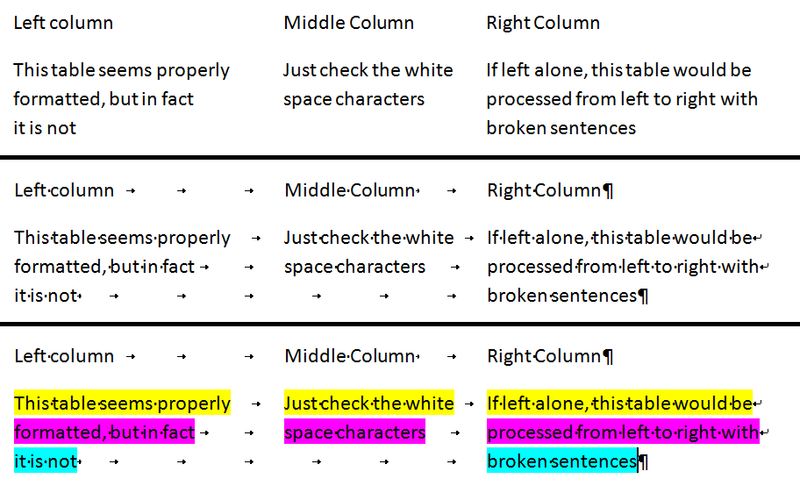 Some may prefer to run a different check during translation than when they run a final check at the end so; for instance you might want to access the Termbase for terminology and check for missing format tags, but not necessarily for global punctuation this can be addressed at once at the end. Working smarter with a tool like Studio by saving different verification profiles could help you to work through a file quickly while making use of all the features. Agencies like ourselves like to run our own verification reports. Translators who have already taken the time to do a verification often get less push-back and it helps to have translators send out a verification report so that it is clear that any false errors were addressed. Agencies that push-back on a file may frustrate translators if it contains a lot of false positives. Sending along a verification report with a job could help to eliminate some of the back and forth. Ultimately, it’s in both the translator’s and agency’s best interest to ensure that checks were run and confirmed to ensure accuracy. Some of the highest loss in productivity comes from working with incompatible software. For translators who do not work with the same software as their agency client, the biggest challenge is to ensure that files can be converted to and from one platform to the next. While it used to be more important for agencies to work with translators who use the same software, we don’t really feel it is necessary to dictate translators what software they use as long as it is compatible with certain translation standards. It does help when a translator knows how to import and export files from other software. Knowing what kind of file types your software can accept will be helpful in a working relationship with an agency that runs different software. Most compatible software has best practices for importing translation files, Translation Memories and Termbases into their workflow. Being familiar with your software is one extra step project managers and translators alike should take in order to work productively and reduce some of the technological frustrations. We look to provide continued support to our translators and the translation community in working with translation software. If you like to work with an agency on your translation needs that supports and promotes excellence in our industry, please contact us.